Email us at cs@greatbaymarine.com and we’ll get back to you shortly with Best Pricing – in tax free New Hampshire! GBM is also proud to announce that we have received the Honda Marine “Premier” Dealer Please click here. Our Parts Department enjoys a well deserved reputation for excellent customer service and tenacious searching. If it’s out there, we will find it! 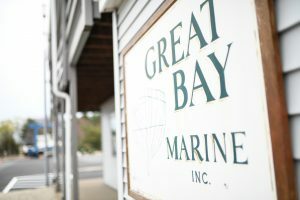 Great Bay Marine keeps common OEM parts on hand. We get deliveries daily and special orders typically arrive in one to three days. Geared towards the Do-it-Yourself Boater, our store also carries paints, cleaning supplies, and hardware. OEM filters, oils and fluids from Honda, Yanmar, Volvo Penta, and MerCruiser. A large selection of Racor fuel/water separator filter elements. Pettit & Interlux yacht finishes and bottom paint. Required Safety Gear – Flares, PFDs, etc. Great Bay Marine Gift Certificate, good in the Ship’s Store, Parts Department, Service, Storage, and Fuel @ the Fuel Dock. Parts Department Hours Monday through Friday from 8:00 am to 4:30 pm. Parts ordered on weekdays can be picked up weekends during Store hours.